Here’s the latest from our friends in Osaka. 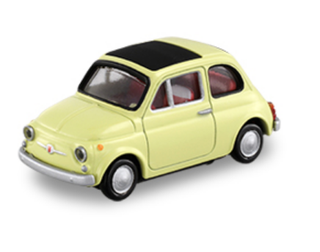 Let’s start with my favourite release for July - the Fiat 500F - #29 in the Premium range. Love it. #30 in the Premium range will be the Lexus LFA Nürburgring Package. That car has already been done 10 years ago in the Limited range, so I’m presuming this will be a new casting. In the regular line-up, we get the new #109 (replacing the VW Polo Police) - Suzuki Swift Sports. I like that one too. And the new #85 (replacing the Toyota FJ Cruiser) is the Fuso Super Great Truck - I’ll leave that one for the kids. And the last one in the Dream Tomica range is the Jurassic Park Explorer that already has been mentioned here. The Ferraris will have to wait until August, I think.